For many nineteenth-century voluntary welfare organisations, there was a competitive market to obtain charitable donations. As such, Christmas was framed as an important means to evoke compassion and a sense of moral obligation amongst potential supporters. 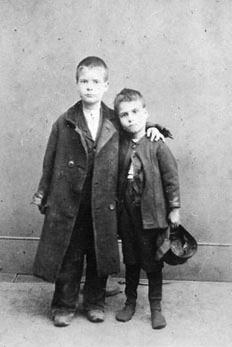 Donations shaped the festive celebrations in The Waifs and Strays Society (WSS), a children’s welfare institution founded in 1881 with 108 homes across the country by 1908. Beyond its usual treatment as a fundraising tool in historical research, Christmas also offers a useful focal point through which to examine inhabitants’ domestic experiences in contrast to daily institutional routines. In the midst of our Christmas joys, surrounded by those we love… we trust friends will remember we have a large family to provide for on Christmas Day and we shall be most grateful for contributions in kind for the Christmas dinner; for sweets, crackers and dolls for the children. Donation records provide some indication of the most common gifts at Christmas. 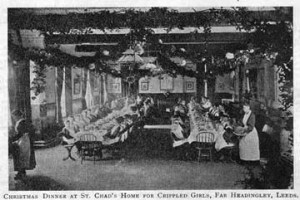 Christmas dinner, for the majority of children in WSS homes, was the most anticipated event and central feature around which all other activities of the day were arranged. As such, beef, mutton, turkey, goose, oranges, plum puddings, cakes and sweets were popular donations. These luxuries were a far cry from regular diet of stews, soups, meat and vegetables. A photograph of Christmas dinner at one home suggests the importance attached to the event: the multitude of evergreen decorations, the use of tablecloths and best clothing worn by the children indicates the grand scale of the special occasion. Matrons’ seats at the end of the tables – whilst indicating a need to supervise children – also suggest some degree of closeness, approachability or intimacy reserved for special occasions. In other homes, photographs highlight that staff members supervised daily meals at separate tables during the rest of the year. Other popular donations included Christmas trees and individual presents including toys and books. Volunteers also dressed as Santa Claus in order to further createa memorable and joyous occasion. Accounts of Christmas festivities were printed in Our Waifs and Strays, serving as positive images that legitimised the Society’s work and acknowledged the generosity of its supporters to a wider public sphere. The Arnold Grove Home confirmed in 1893 that their supporters had ‘filled to overflowing, not only our stocking, but our larders and our hearts’. Meanwhile, staff at Hanley Castle stated it was a ‘great pleasure to see their happy faces’ upon handing out children’s presents. Other accounts detail the rituals of Christmas preparations and the festivities on the day itself. 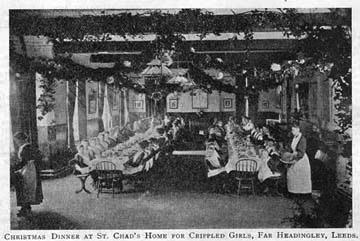 Girls at the Exeter Home awoke their matron in the morning by singing carols outside her door, before attending a church service. Then followed Christmas dinner and a visit from Santa Claus. Boys at Elm Lodge, Liverpool decorated each room with evergreens before Christmas day whilst some new boys were taught the unfamiliar routines of stocking hanging. Children were not confined to WSS homes either: carol singing in the local community not only raised money for the home, but also heightened children’s spirits. Such activities encouraged interest and support from the community. Local supporters, for example, paid for children at the Worsley Home to see a performance of Beauty and the Beast at the Free Trade Hall in Manchester during the Christmas holiday in 1903. Numerous children’s letters detailing Christmas experiences were printed in Our Waifs and Strays, but the authenticity of these accounts is difficult to ascertain. Many letters were likely to have been edited by WSS staff or entirely fictional. They do, however, provide clear insights into how the Society wished their festive endeavours to be perceived. A letter in 1886, supposedly from Richard B, aged 8, confirms the joy of a Christmas dinner consisting of plum pudding, roast beef and mince pies, stating ‘us boys never had such nice things like that before…we are very happy little boys’. Children’s biological relatives were not absent from their lives during Christmas: case files attest to numerous Christmas cards and presents received by WSS residents. Visiting days in December and January must have held some special significance, especially as WSS regulations prohibited children spending holidays with their families. However, this did not prevent some children from returning home: William R’s mother requested her son to be permanently restored to her care before Christmas in 1909, citing her improved circumstances. This was agreed to and William returned home on Christmas Eve, only to be readmitted on January 3rd after the Society discovered his mother was not in a position to provide for him. William’s mother appears to have temporarily misled the Society as to her circumstances in order to enable her son to spend Christmas at home. What can we learn, therefore, about the ways in which welfare-recipient children experienced Christmas in the institution? Experiences largely depended on the generosity of patrons, although this was shaped to some extent by the WSS’s own appeals for certain gifts. 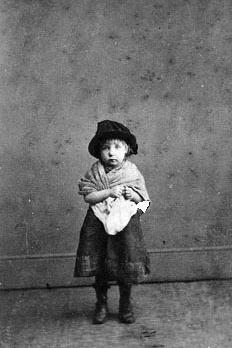 Rather than saving children from ‘a life of want and misery’ by supplying only the basic needs of clothing, food and shelter, at Christmas, the Society was concerned with providing destitute children with a more lavish and ‘homely’ festival that many were unlikely to have previously encountered. For many inhabitants, however, the provision of more luxurious material goods at Christmas was, in all likelihood, a poor substitute for the joys associated with spending Christmas at home with the familiar faces of relatives that loved and cared for them. This entry was posted in Claudia Soares, New Researchers, Research and tagged children, Christmas, families, philanthropy. Bookmark the permalink.